"This simple and unique smoothie is perfect for breakfast or snacking. Has a smooth, uniform flavor that makes it light and delicious." 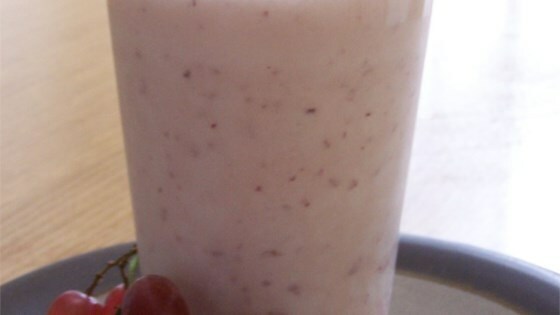 In a blender, mix the grapes, milk, peach yogurt, sugar, vanilla, and ice. Blend until smooth. Fruit blended with creamy yogurt and cold milk makes a refreshing summer snack. great, cool and refreshing. Only added 1 tsp of vanilla, and used lemon yogurt since that was what we had. I omitted the sugar and ended up with a great smoothie that even my two yr olds loved! I froze the grapes and omitted the ice. I also used one packet of Truvia in place of the granulated sugar. This was okay. Drinkable but not my favorite. My 7 year old was a little nervous as I made it but loved it. It is light and very peachy. I think it would work with any yogurt. Followed recipe exactly. Thanks. This smoothie was very good! I love to make it when I don't have ingredients like strawberries on hand (which a lot of smoothies call for). I will definatley continue to make this! Pretty nice - I used banana yogurt because that's what I had. Kids raved. Good, easy to make and looks presentable. I didn't care for this, I didn't think the combination of grape and vanilla went well together.